Operate! Operate! Still time to operate! 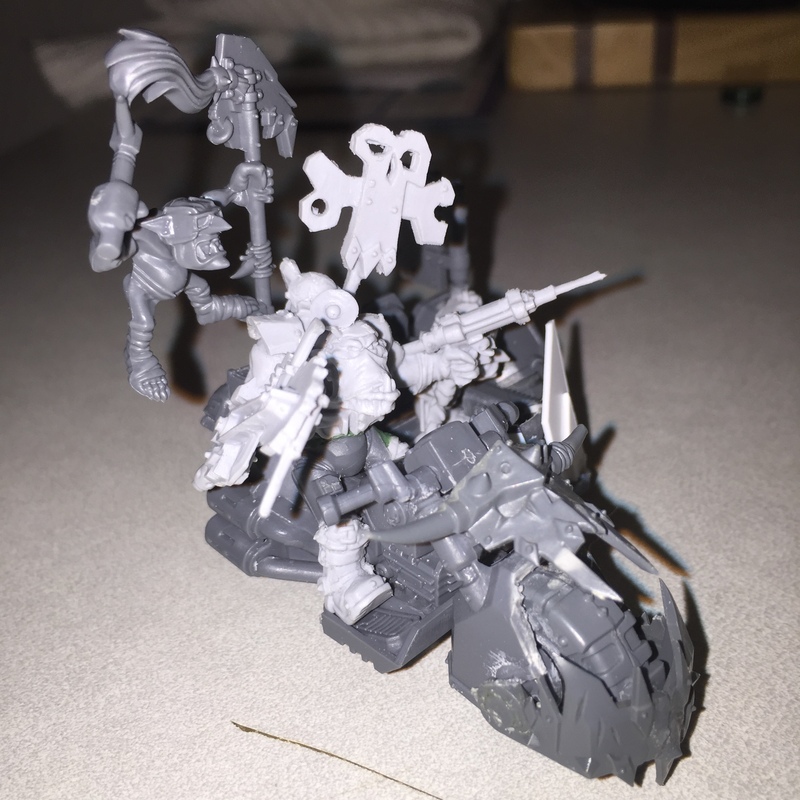 If you are going to run Orks, you need someone to patch up your boyz when they inevitably get shot up by the enemy. 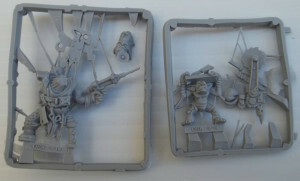 Thankfully, there are Painboyz with their ‘Urty Syringes, collection of rusty Doc Tools, and pack of Grot Orderlies running around ready to reattach an arm here, replace a leg there, maybe add a rocket launcha just for kicks. 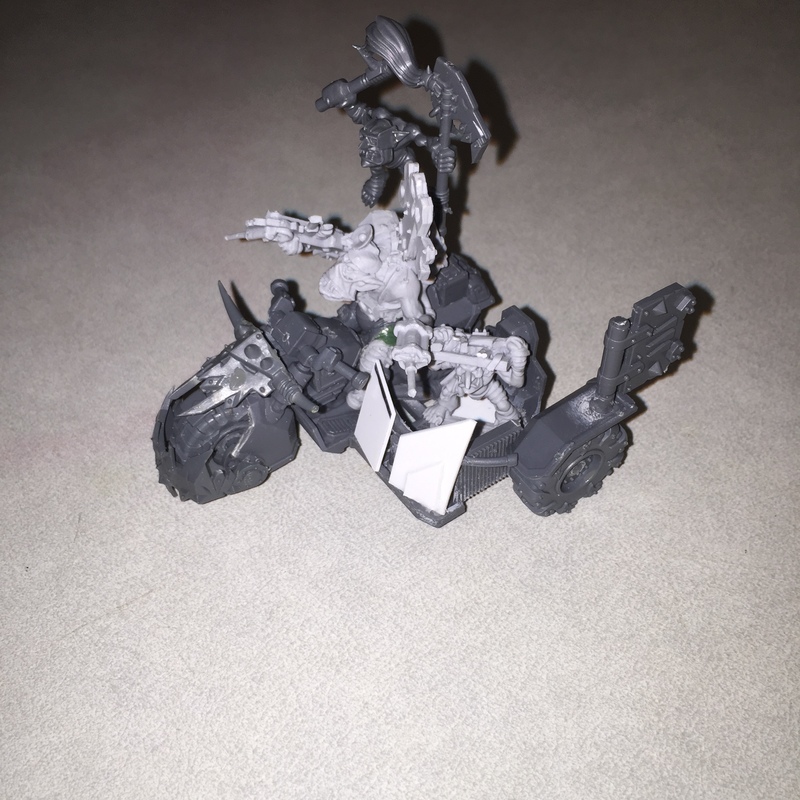 Naturally, I needed one in my army, and since I’m going for speed he was going to need bike. There is a fairly cool looking plastic Painboy model available now, but for this project I decided to go with the older design which is still available in Finecast from the Games Workshop website. 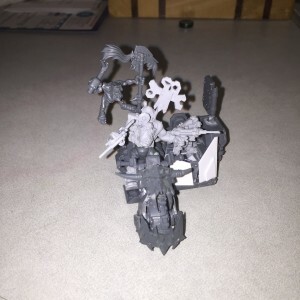 This was my first experience with Finecast and I am kind of hoping it will be my last. It is a very fragile material, which makes it easy to cut up for modifications, but also means that pieces break off at the slightest pressure. I spent more time trying to get the doc to stay together then I did building his custom bike. 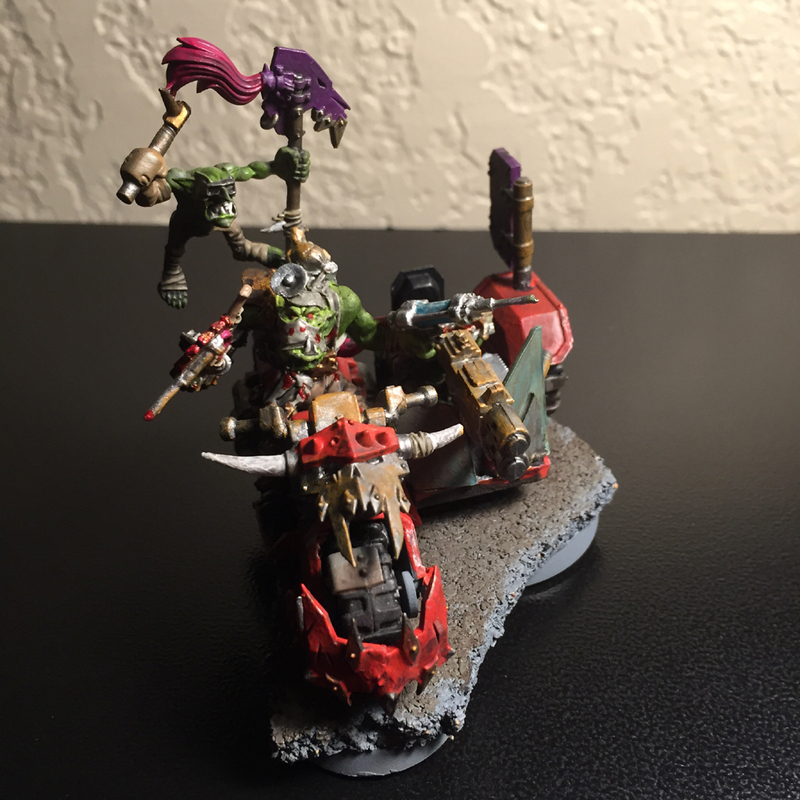 For that custom bike I needed a suitable base. 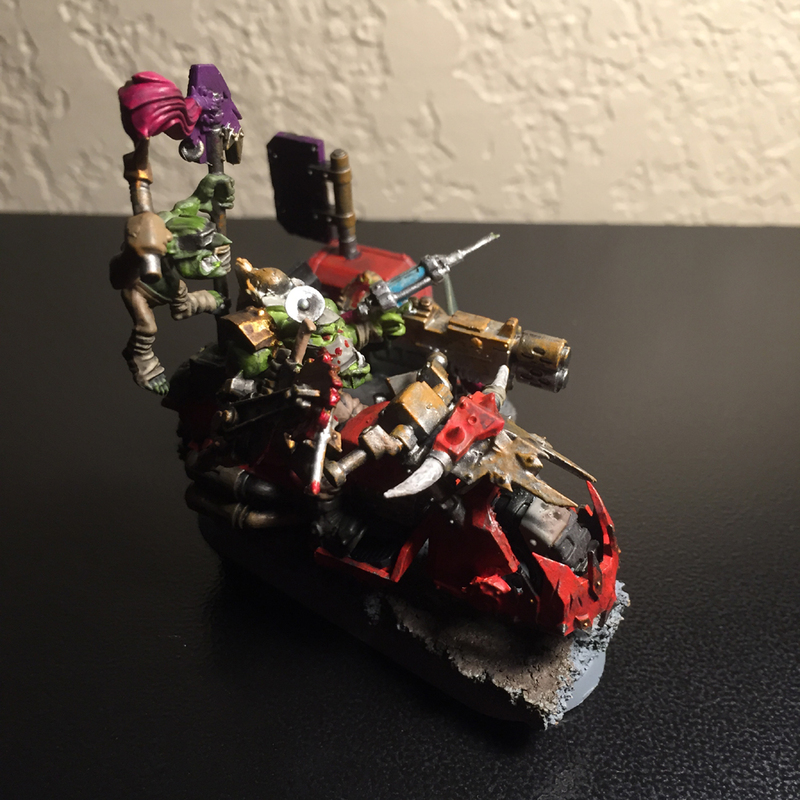 I could have just used an Ork Warbiker, but since the Painboy model came with a Grot, I figured it would be nice to have a sidecar so he could ride shotgun and keep the docs tray of pointing doc tools at the ready. Thankfully, Games Workshop just happens to have a Space Marine bike that was perfect for my purposes. It was going to need a bit of work to fit the Ork aesthetic however, far to shiny and new looking. A Warbiker kit gave me all the parts I needed to properly customize the bike, and I was able to cut up the Painboy and se the Marine biker’s legs to fit the ork right proper in his seat. 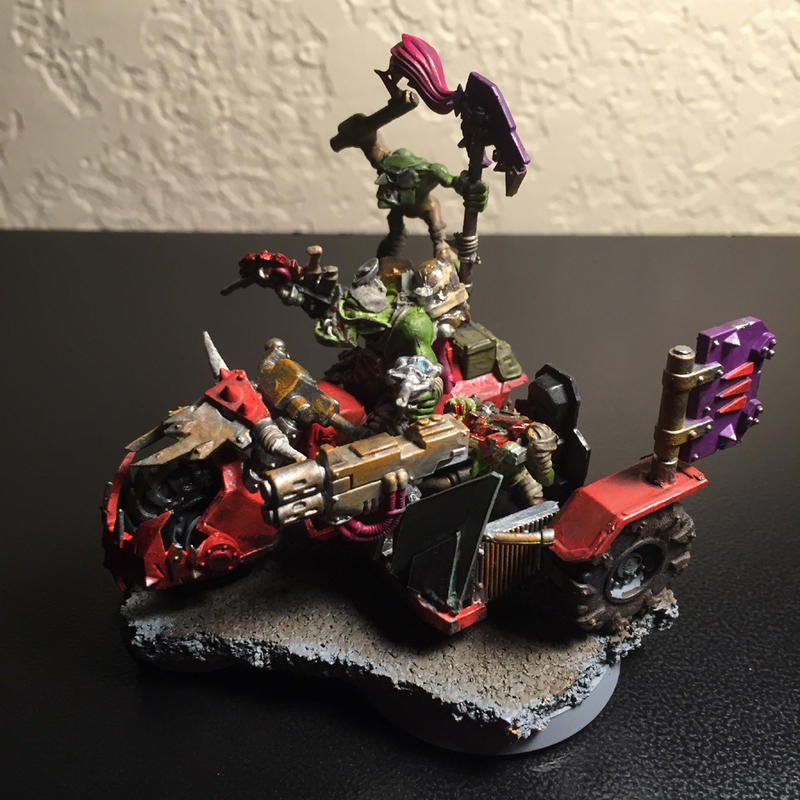 Some plasticard added some much needed extra armor to the side car and I was ready to prime. I followed essentially the same paint scheme I have used on my previous Ork custom projects. Plenty of red to make it go fast and then assorted metalics with some rust and black wash to give it that beat up look I think an Ork vehicle needs. These are rugged well used machines after all. One thing that might be noticeable is that I decided to give the Blood for the Blood God technical paint a try. I figured a Painboy was likely to spend most of his time covered in blood from all his surgeries, and I really like the effect it gives. One final shot to give some scale. That and I just really like showing off my Warboss. 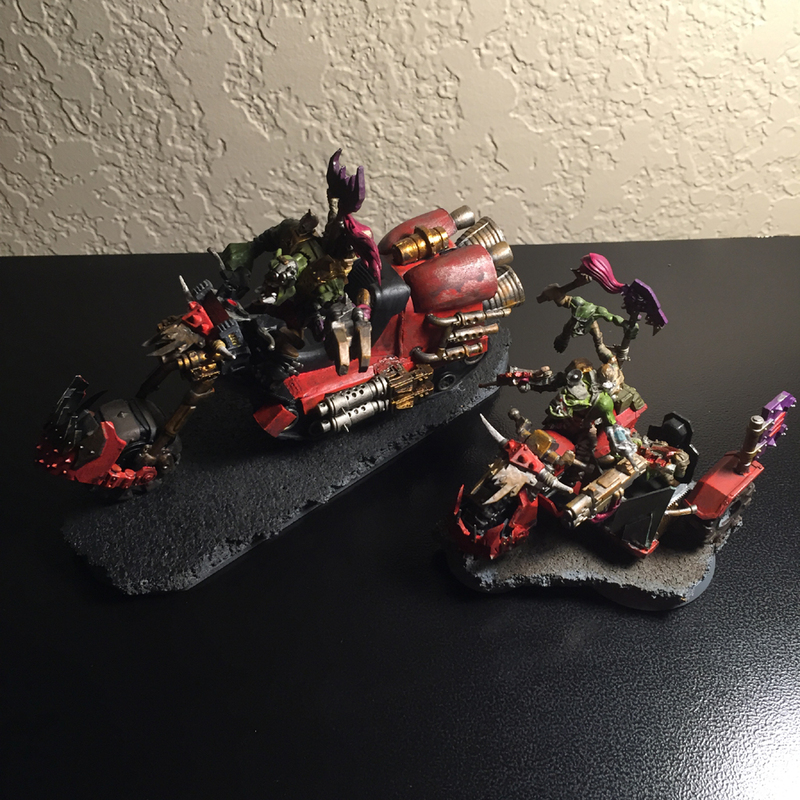 So far my little Kult of Speed is coming together pretty well. I hope to have my trio of custom warbuggies and a bunch of bikes ready in the next few weeks to give me a solid start to this army.